Disclaimer: PACKiT provided us with the below mentioned product in exchange for an honest review. All opinions are 100% Honest, my own, and are not influenced in any way. This Post contains Affiliate Links. After attending a BTS Event with Mom Trends back in July, we were sent a nice little gift which included a PackIt Freezable Lunch bag that we now use ALL the time. A few months later I decided to reach out to the company and ask to review their Freezable Grocery Bag. They said yes! Now I was ready to go on my couponing adventures without any worries about my cold items. When I go shopping for groceries, I like to compare prices to try and find my cheapest options. Sometimes my first store has better prices on certain refrigerator and freezer items than the second store. Before my PackiT Freezable Grocery bag, I had to choose whether to buy that milk and ice cream in store 1 and risk it melting or getting bad.... or Buy them at store 2 for a bit more than I actually wanted to spend. Now that I have my awesome bag, I'm able to shop for up to 6 hrs and I don't have to worry about my cold foods not staying cold. I love how compact it folds! My freezer is ALWAYS packed so I am pretty glad that it fits in there. 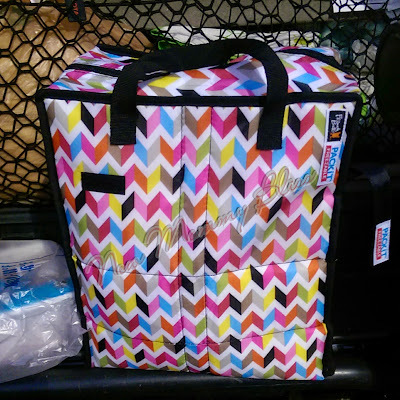 The Freezable Grocery Bag/ Shop Cooler retails for $24.99 and has a patented gel liner. After freezing it for 12 hours your ready to go. I must admit... I actually FORGOT to freeze my bag the day before doing my monthly BJs/Walmart Haul and I was so afraid that it wouldn't work. Guess What? IT STILL WORKED! After BJs, I filled the bag with Frozen Fish Sticks, Frozen Beef Patties, Butter, Cream cheese, Frying cheese and a bit more at around 4:45pm. We then went to Walmart and shopped there until 6:33pm. Since we shop in Jersey (live in New York) it takes us about an hour to get home when there's traffic. By the time we got home and found parking it was 8:00pm. There is NO elevator in our building so we have to walk up and down 3 flights of stairs MULTIPLE times. We got everything in the house by 9pm. We were unpacking and organizing all the groceries, then at 10:15pm we finally unpacked our shop cooler. Everything was still COLD! That moment right there had me sold! 5.5 Hours later and the bag I forgot to freeze STILL kept my food cold! I'm loving how much space this has and really impressed with how much you were able to pack into it! I'd love one of these for grocery shopping! Putting this on my wish list! Love it. This is great. I never would have imagined that something like that would work so well. Thanks very much for the review. I know this review is old, but I'm happy I found it. I was searching for someone who had used the bag without freezing it, since I know I will often use it after work, and won't necessarily be able to freeze it.